It was 6:00 am. A text message came from UNOCHA (United Nation Office for the Coordination of Humanitarian Affairs). ‘The Israeli Army is demolishing homes now at Hadadiya’ Can you come! This was the place of my first visit to the Jordan Valley just a month ago. 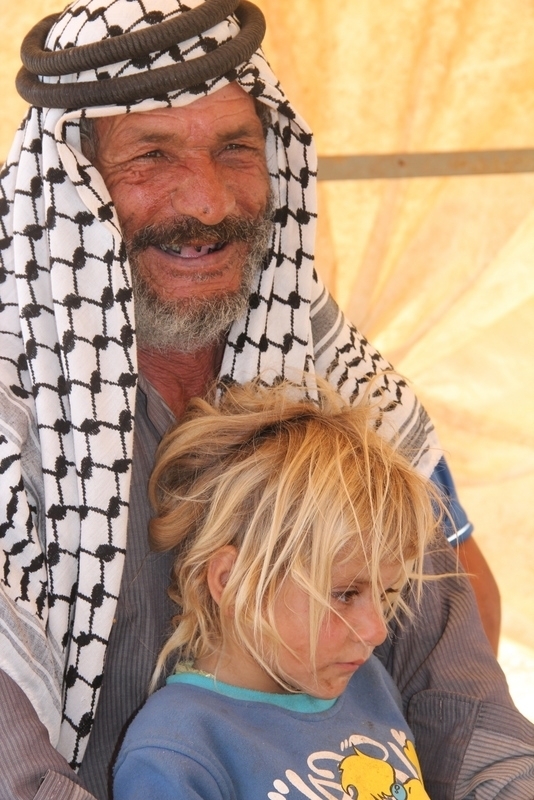 We had met with Abu Saker under the shelter of a tent as he spoke to us about the problems of the Jordan Valley and the ever-present fear of the demolishing of his home by the Israeli Army. Because of this, he would erect only this basic structure. Abu Saker is a very active member of Jordan Valley Solidarity, a group, devoted to protecting the land of the Palestinians and Bedouins in the Jordan Valley against the onslaught of Israeli efforts to relocate them. I was especially touched when the women of our group were invited to join the women in their quarters…another tent not far away….where they were making cheese. When the daughter, in her teens, saw that I was old, she was excited and pulled me into the tent to show her mother. Then they were both excited and I wasn’t sure what it was about me that created such high energy! I sat on a stone and watched them at their work and was given new, fresh cheese to eat. The seating arrangement was extremely trying for my replaced hip and I was glad to change position when it was time to go. I asked, as I was leaving, what the women were trying to say to me. It turned out that they wanted me to stay as company for the mother. I thought it was a unique take on the ‘spirited away by the Arabs’ theme!!! So…. this was where the bulldozers were busy at work as we got ourselves ready to go. Although we arrived within the hour, the bulldozers had already finished and left. We almost wept as we surveyed the devastation around us. People who had so little to begin with were left with nothing, not even shelter from the blistering sun. Sheep were milling about, lambs were nibbling on our buttons. A little girl, probably five years old was offering tea on a tray.We helped the men load a collapsed tent unto a cart as they were preparing to erect a shelter for the animals…… the first item on the agenda. The women started to make cheese. Life must immediately go on. Some felt that the Israeli Army hadn’t finished its mornings assignments and was proceeding to another location. There was an informed guess as to where that might be and so we divided up. One of us, Hilary, EA from Ireland, stayed to complete her report on Hadadiya, while Liva, EA from Norway and I scouted the area to see if we could spot the bulldozers. Just as we were about to give up, we spotted them making a turn off the main road and our driver Ghasson, knew exactly where they were headed – Khibert Yahtza. We couldn’t follow because the road, which used to be the road to the community, was now a closed military road for the Israeli Army only. We had to use a circuitous route through the mountains to get to the tiny village. We have lots of woods roads in Newfoundland that are quite rough but nothing I had ever been on compared with this. (Perhaps the Rick Mercer segment, where he and Danny Williams, in a monster truck ,made its way through the rough terrain of unspoiled interior Newfoundland, could compare). We wound our way up the mountain, inching along sheer cliffs, deep ruts and earth mound obstructions in strategic places. As we idled along, we were struck by some of the most spectacular views in the world. I wondered about pregnant women who needed emergency care getting to hospital! 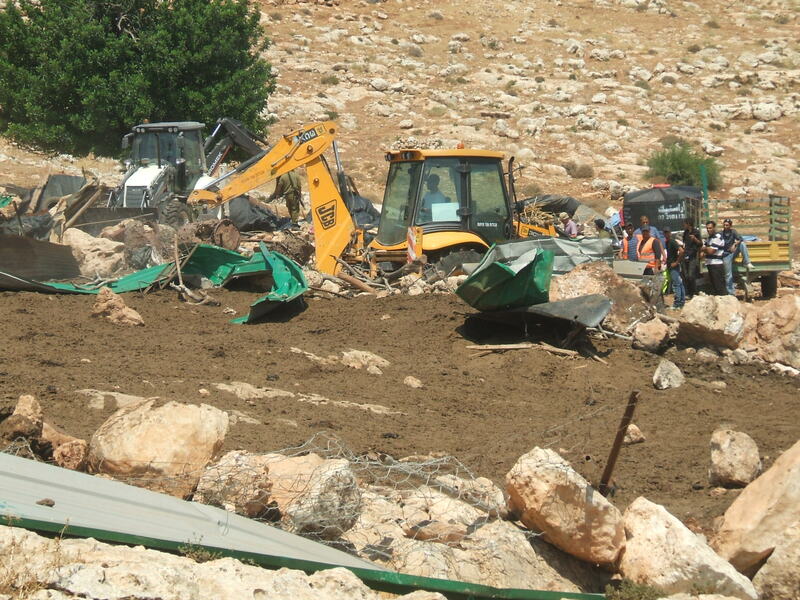 After an hour we rounded a corner and came upon the bulldozers in action. A military jeep prevented us from going further and we were ordered at gun point not to pass on foot. We did manoeuver our way closer, frustrating the soldiers because they were taken completely by surprise and obviously had no plan to deal with us. We wouldn’t listen! We were witnessing what was supposed to be a covert action! And ….we had cameras! However, this cat and mouse game didn’t last long. There really wasn’t much to destroy and it was over in under half an hour. 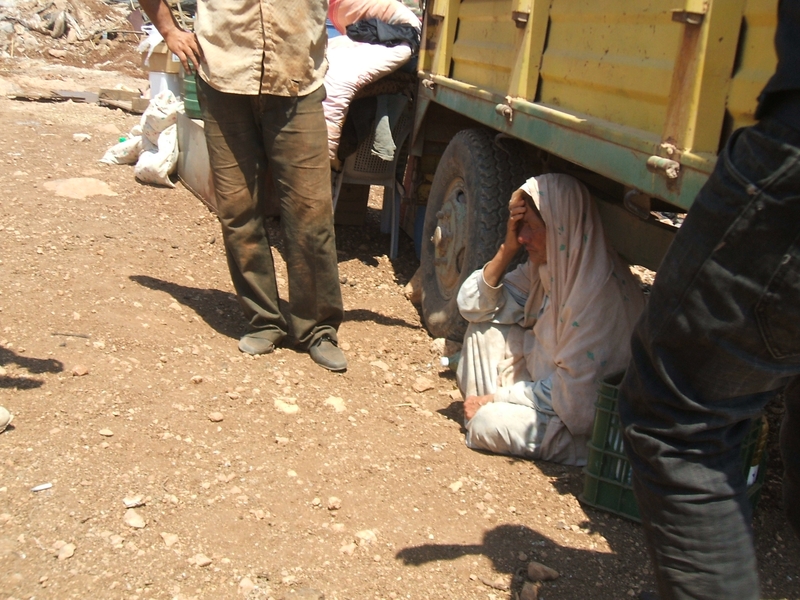 As they pulled out and I was able to move closer, I found an elderly woman sitting under a tractor cart, weeping. She had just watched everything she owned bulldozed into a heap. Her savings of 10,000 NIS put aside for her son’s weddin next month was buried beneath the rubble. I sat beside her, holding her hand – there was little else I could do. Phone calls to UNOCHA and the ICRC (International Committee of the Red Cross) brought action quickly. 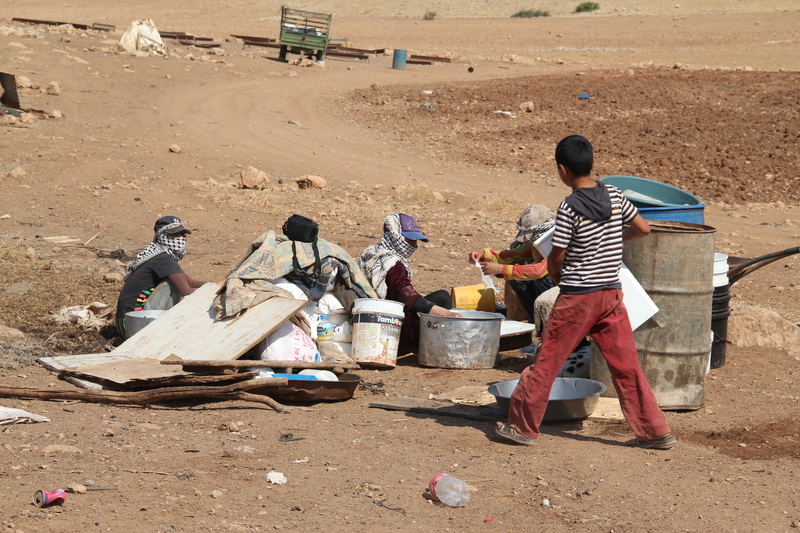 Reports were given and plans made to bring supplies – a tent and water, basic necessities in the Jordan Valley where temperatures this time of year already reach the 40’s. 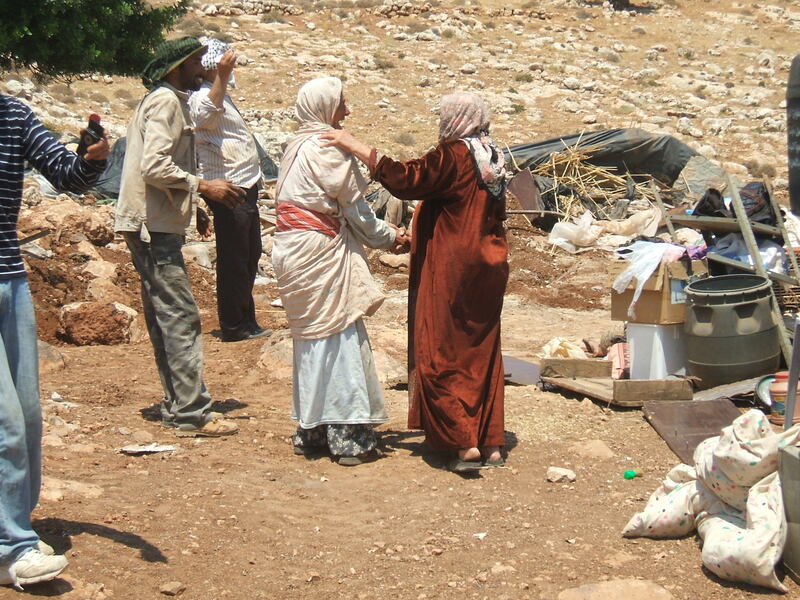 Then the family will rebuild – active resistance to the Israeli State’s efforts to relocate them. It doesn’t make sense to me. People who have eked a living and have made their homes, (much like the people of the north in my country) in an unforgiving environment for generations, are being forced out of their small communities , while settlers, who live in illegal colonies next door, are encouraged to move and live there by being given lovely urban houses, as much water as they want, and all the amenities of an urban lifestyle. In fact the State of Israel has just quietly announced that they are going to double the size of the existing colonies in the Jordan Valley! It is heartbreaking to witness this injustice and know that so little is being done about it. Jordan Valley Solidarity is working to highlight these injustices and help the indigenous people of this land in their efforts to protect their rights and their land. Heart-breaking is indeed the word to describe the covert military actions. Thanks Patricia for being there and documenting this. How does it get stopped? i don’t think there is anything as sorrowful as watching people’s homes being destroyed. That it happens again and again all over Palestine and particularly in Jerusalem makes it no easier. Like most Canadians I would not have believed it or I would have thought there was some logical reason for it. There isn’t. It is simply intimidation, trying to get Palestinians to give up their land. Thank you Yanoun team for being there to witness, document and tell the story.